Epithelial-like Human Caucasian Breast Adenocarcinoma. Description: Human Caucasian breast adenocarcinoma, established from the pleural effusion from a 69 year female caucasian suffering from a breast adenocarcinoma. 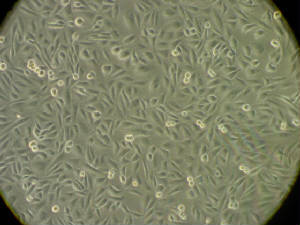 Cells exhibit some features of differentiated mammary epithelium (epithelial-like) including oestradiol synthesis and formation of domes. Cells may carry B or C type retrovirus and are considered to represent a category 2 pathogen (P2 containment). Cells express both the wildtype and variant oestrogen receptors as well as progesterone receptor.